As I write this, J’s driving down Route 3 in British Columbia toward the US border. Rather than wax poetic about her driving skills, the mountainous views or our first visit to a Canadian Wal-mart, I thought I would switch it up a bit and tell you about our “go-to” products on this trip. No endorsements have been gathered, but if any of the companies below would like to contact us regarding sponsorships, we would be happy to share firedandfree’s visitor data to include addresses, social security numbers and/or voting registration data for our vast array of visitors. 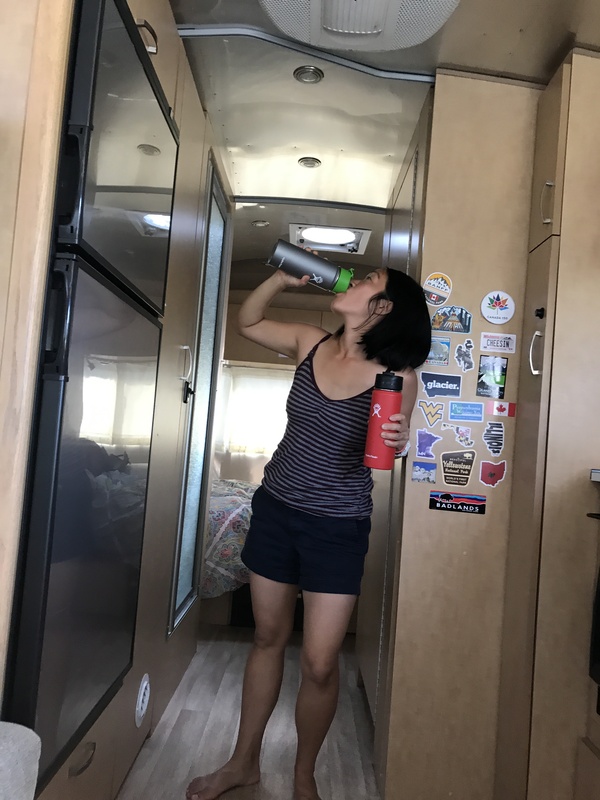 Hydro Flask – before we became RV wanderers, I don’t know what we did without our Hydro Flask bottles. I usually don’t get too excited about a liquid receptacle, but this thing is incredible. Put ice cubes in it and the ice cubes will be there 8 hours later after sitting in your hot car. Fill it with hot coffee from Starbucks and your mouth will still be burning an hour later. There are probably cancer causing materials holding the thing together, but who cares when that $4 latte stays good for the entire morning!? (Hat tip to BShip for the suggestion). Ceramic skillet – J is a big proponent of ceramic skillets as they don’t stick. As I’m the one doing most of the dish washing, I’d have to agree as this thing makes my life a lot easier. When you’ve been operating off of 5 gallon water jugs, making things easy to clean is a big plus. Kerry Gold Butter – we switched to a high fat diet about a year ago and Kerry Gold is a big part of our daily fat intake. We load it up on our morning toast and I swear it’s replaced coffee as my morning energy booster. Eat a whole stick and you can probably shoot webs out of your wrists. Taylor Farms organic bag salad mix – even though the temptation is high to eat camp food everyday, we are still trying to “eat good” while traveling. These baggies of green goodness (no, not that green stuff), have been a lunch or dinner for us. There are a variety of “flavors” and you can whip one up at a picnic shelter or rest stop. We’ll be buying these at home for sure. Visit your local Costco and serve em up tonight. Just go easy on the dressing as it’s a little strong for our liking. Bota Box wine – you’ve heard us heep loads of praise for Bota in the past, but it bears repeating. Buy a box of this stuff and it will last you days (hopefully days as it has 4 bottles worth). Plus, you can get a box for about $18 at Walmart. We tried the Dry Rosé in Houston and can’t wait to find another box in Spokane (Canada didn’t sell Bota). Other flavors we like are Nighthawk, Redvolution, Cab Sav and Pinot Grigio. Oh yeah, having a cardboard box of wine is way easier to store in an RV versus glass bottles. Ceramic knife – J brought 4 knifes for the trip, but she’s only used 1 for most of the trip. This 5 inch pairing knife has been used for cutting Lil D’s and E’s food into small pieces, veggies, fruits, sausages and for threatening D during our especially unruly disputes. Stokke Chair – out of everything on this list, this is the one thing that we can not live without. You’ve heard about Lil D’s mutant power of “going liquid” and without this chair, meals would be absolutely unbearable. Thankfully, Tin E is big enough for this thing and it’s slim profile makes it easy to store during our drives. It’s not a cheap chair, but the Stokke has been the only chair we’ve needed for E and Lil D’s upbringing. Thanks Momma Chow for the gift that keeps giving! Icebreaker t-shirt – as I write this post, I’m wearing my blue icebreaker t-shirt. I have been wearing this same shirt since our flight from Houston over 6 days ago. I’m guessing many of you just went, “Ewwwwwww!” However, this shirt doesn’t smell at all (I swear) and it has kept its shape remarkably well. The secret is that it is over 80% wool and that wool doesn’t retain smell. Go get one and wear it everyday to work. I won’t judge you, but I’m guessing your co-workers will! Toms water boots – if Tom is out there reading this, you really need to sponsor E as one of your signature athletes. These boots are her go-to for hiking, running, jumping in glacier water, hitting the park and pretty much anything a 3 year old can get into. We don’t know how she does it as they look crazy hot, but they are the only shoes she wears with any consistency. She doesn’t even wear socks with them which is way smellier than my t-shirt. Crocs – these are probably the dorkiest pair of shoes you can wear on your feet, but they are essential for living the RV life. They are perfect for protecting your feet from all sorts of weird shower fungus that we may encounter at RV parks and you always need a quick solution for your feet when grabbing something out in the truck at random hours. Thanks to my bro for giving me these after he ordered the wrong size. Pools – visiting aquatic centers are probably our favorite all-family activity. Plus, getting a shower included adds to the functionality of the visit. Activity books in parks – these have been a game-changer for us. How do you make visiting a National Park super exciting for a 3 year old – you give them a book that asks them to color in a bear or find a moose out in the wild. And why would a kid want to do such a thing? Because they get a cool badge of course! Go National Park Service for saving the day and encouraging our daughter to visit every park out there. Costco and Safeway Gas – the cheapest gas around and with extra large bays for the trailer. Also, if you use your mom’s Safeway card, you can get amazing deals like $1 off each gallon of gas. Thanks mom! LED fairy lights – these things are a must for chilling your kid out at bed time. It works like this, “E if you don’t calm down right now we are taking your butterfly lights away.” Works like a charm.